Cover of the 2000 Wilshire Books first edition of The Secret of Overcoming Verbal Abuse by Albert Ellis, Ph.D. and Marcia Grad Powers. Design and illustration by Peter Thorpe. 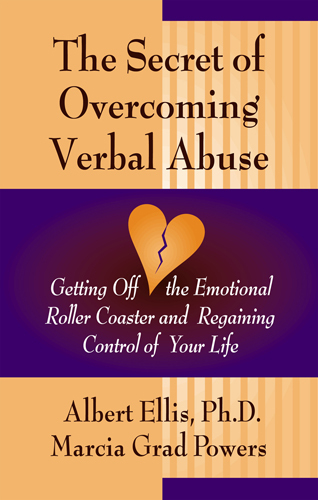 The first edition of The Secret of Overcoming Verbal Abuse by Albert Ellis, Ph.D. and Marcia Grad Powers was released by Wilshire Books in 2000. Design Director: Marcia Grad Powers. Design and illustration: Peter Thorpe.